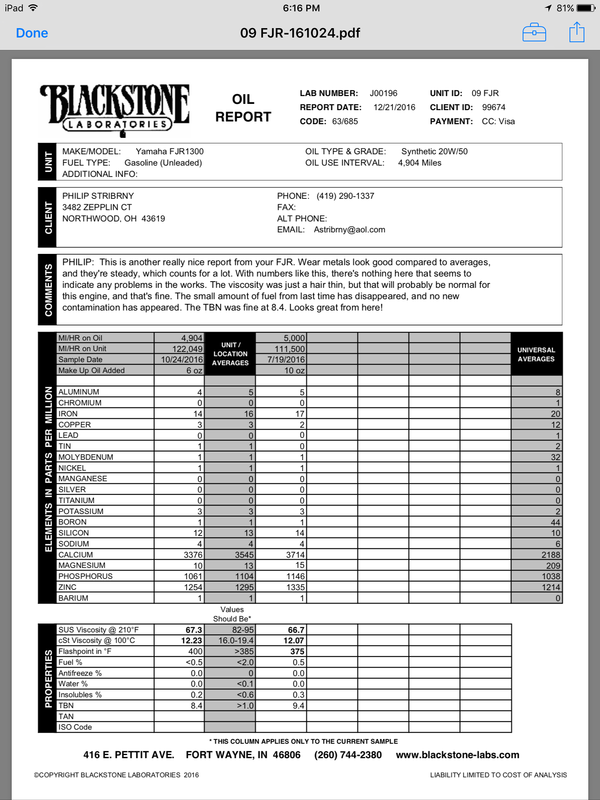 Ever consider sending an oil sample to Blackstone? I did when my bike hit 111,000 then again at 122,000 just to see if a catastrophic failure was imminent (there were no obvious indications that I could see). My reports came back excellent and give me the peace of mind to continue to run across the country and back. I'm too superstitious for an oil report. I'm just going to keep doing exactly what I do and see how long it'll go. I have a parts bike with a low-mileage engine stored in the workshop in case I need to swap at some point, which I think makes my current motor pretty much indestructible. One of these days I should probably put in a new clutch, though, just for grins. I too always used simple oil and change around the same mileage. Yes, I have posted many UOAs from the bikes below on Bob in the Oil Guy and a VOA of the oil I currently use. Another update; she's up to 130K now. I feel like I've cheated - the original engine had a stretched timing chain around 116k and I had a bike a buddy sold me for $1500 with a low-mileage engine in it, so instead of doing all the state inspection, title, and tag work and paying all the fees, I just swapped motors. I figured I could, in theory, have my original motor rebuilt, but that would've cost me more, probably. So I'm still racking up the miles. Congrats, but yeah, you cheated. Rebuilding your worn engine would have cost double that, for parts only. Labour would have added another $1200 or more. You did well to just swap the motors. FX4 and scottbass like this. Congrats, luck of the draw. You got a good one. They are disposable bikes. Most do not make it anywhere close to 100k miles. The vast majority are done by 75k miles. A handful are dead by 35k. This is the first one I actually know about hitting 100k without major problems getting there. Maybe luck of the draw, maybe he is exceptionally light on the throttle.